It was going to be a routine mission, over in less than an hour. An elite group of Rangers and Delta Force soldiers are sent into Mogdishu to capture a warlord's advisors. What started out as a mission in goodwill, will end up as a military blunder. Black Hawk Down is a story about the bravery and heroism in dire circumstances. The cast includes: Josh Hartnett, Ewan McGregor, Jason Isaacs, Tom Sizemore, William Fichtner, Jeff Sanderson, Eric Bana, and Sam Shepard. 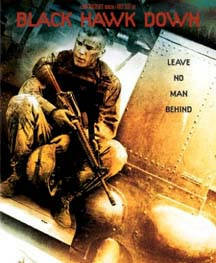 Director Ridley Scott (Blade Runner, Gladiator, Thema and Louise) brings you Black Hawk Down, a thrilling war movie based on a true event that happened on October 3, 1993 in Somalia.